John Deere is launching two new top of the range six-cylinder tractor models rated at 230 and 250hp (97/68 EC), designed to meet the needs of contractors and arable farmers. The 6230R and 6250R will complete the line-up of John Deere 6R Series tractors from summer 2017. The 6230R and 6250R set new standards for transport, operator comfort and acceleration on the road. Thanks to an engine boost of 50hp with intelligent power management (IPM), the flagship 6250R tractor provides up to 300hp when required. With a very light vehicle weight of 9.3 tonnes, the 6250R delivers more power than any other tractor in this weight class, along with an unrivalled power density of 31kg/hp. The high maximum permissible weight of 15 tonnes also allows a 5.7 tonne payload, which means the tractor is able to transport heavier loads. Both these new tractors are powered by a 6.8-litre PowerTech PSS engine with dual turbochargers and advanced DPF and SCR technology, which responds very quickly to changing loads while consuming less fuel and meeting demanding Stage IV emission standards. The upgraded AutoPowr transmission delivers maximum efficiency, with 100 per cent mechanical power available at 3.5km/h for heavy draft operations, 11km/h for light draft work, 22.5km/h for heavy transport and 47.2km/h for light transport duties. Once running at maximum road speed, rpm automatically drops and 50km/h is maintained at 1630rpm and 40km/h at 1300rpm, which results in lower fuel consumption on the road. The tractors also feature an all-new CommandPRO joystick, which introduces a new dimension in ergonomics and versatility to John Deere tractors. Top speed can be reached with just one push, and 11 programmable buttons are available for the hitch, PTO, SCVs, AutoTrac controls etc. The functionality of CommandPRO allows the tractor to be controlled from top speed to zero with a simple push or pull of the joystick, and lower speeds from 0 to 2km/h can be achieved with the creeper control function. Both the joystick and pedals can be operated at the same time, and there is no need for an external ISOBUS joystick as the driver can also operate the tractor and ISOBUS functions simultaneously. Equipped with a pressure and flow compensated hydraulic system, the new 6R Series tractors deliver a powerful maximum flow of 160 litres/min at 1500rpm. This also saves fuel, even in the most demanding hydraulic applications. Up to six SCVs with individual pressure-relief levers have been grouped together for easier access, and new lift capacities are 10.4 tonnes on the rear hitch and 5 tonnes at the front. The 6230R and 6250R tractors also feature a high level of operator comfort. The intelligent hydro-pneumatic cab suspension (HCS Plus) system offers more driving comfort and isolation from noise and vibration. Better traction and up to 10 per cent more power applied to the ground are provided by the new self-levelling TLS Plus triple link suspension system on the front axle. This automatically adjusts sensitivity and suspension rate, and synchronises with hitch sensing to compensate for power hop under heavy draft conditions. 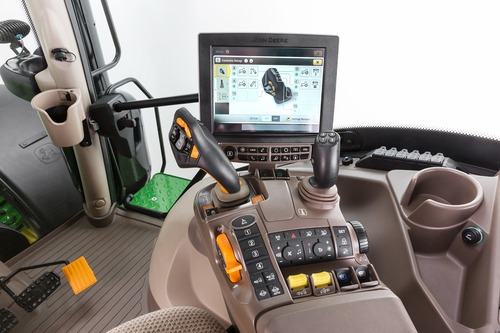 Less arm movement and significantly less steering effort is required by the variable ratio steering (VRS) system, which can be activated and deactivated from the tractor’s CommandCenter control console. Other options include a new connectivity package featuring MyJobsConnect and MyJobsManager apps, which enable drivers to view and carry out tasks in real time via their mobile device. John Deere is also the first full-line agricultural manufacturer to introduce a navigation and logistics optimisation system specially designed for farm use. The Intelligent Ag Navigation & Fleet Logistics system features all farm roads plus a fleet overview, and shows drivers the fastest and safest way to a field entrance. It can also navigate operators between an unloading point and a lead machine that moves from field to field, such as a combine or forage harvester. Key service points on the new 6R Series tractors are easy to access for maintenance. Both models feature 750 hour engine oil filter, fuel filter and engine oil intervals, helping to further reduce parts and servicing costs.The lifetime diesel particulate filter (DPF) and low diesel exhaust fluid consumption of 2 to 3 per cent provide additional savings.